Perry 28mm ACW Battle in a Box game update. This post discusses yet another attempt to get the game set done and presents a first action, which itself gives a grateful nod to the world of blogging. Here is a quick reminder of what our box of goodies gives us. We have 4 infantry units, 1 cavalry unit, 1 artillery unit and 1 general per side, plus a bit of terrain, so this offers a nice opportunity for the visual to meet the practical in terms of attractive 28’s sitting in a small gaming space, with armies that are sized to ideally suit some quick play rules, which the box includes (called Firepower), but also fitting with popular sets such as Neil Thomas’ One Hour Wargaming rules, which uses 4 - 6 units per side in just a 3’ x 3’ space. On returning to this project, it was good to open the box and see that four Confederate Regiments, one Union regiment and one Union artillery piece had already been painted and based. This leaves the rest of the Union’s three regiments (including one Zouave regiment), two generals, three artillery pieces, two cavalry units, fencing and a building to be put together, painted, based and otherwise made tasty! A bag of eight metal casualties have been added to each side, figures that were picked up at the Phalanx wargame show from 1st Corps, together with some dice frames and 10mm dice bought from Warbases at the same show. I originally bought 7mm dice and frames, but these were too small for my banana fingers to pick them out from the MDF frames with any ease. The bigger dice are a bit more obtrusive - but they work for me. Two significant changes are going to influence how this project moves forward. Firstly if I have something ready and primed on sticks, then I will paint most days until completed. My problem is that once done, unless there is something else already primed and ready to go, the painting momentum is lost and that stalling typically leads to fairly long spells of inactivity on the painting side of things. To deal with that, I have glued up all the remaining box contents over a couple of days and temporarily attached the figures to their bases with a latex based glue, rather than going with my usual ‘must fully complete one unit at a time’ production line process, so now the army is prepped, available and also usable. Another box of infantry has been bought with the intention of priming a unit of 18 and putting them on sticks. This allows always having one unit on sticks, which when completed can be cycled into the ‘on table’ collection and one of the unpainted bases removed and put through the painting process and hopefully seeing and using this ‘improving’ army will maintain painting motivation. Secondly, if I spend a long time planning and prepping armies and rules for a project that can only produce a game many months into the future, then typically something else will come and grab my attention, so as a counter to that, while painting the figures, I will be gaming with them and the terrain, regardless as to what state they happen to be in - painted / unpainted / part constructed etc (I know that will offend some gamers eyes, but I have jumped that hurdle) so that interest is maintained and also allow for the developing of rules, scenarios, terrain and basing systems that will gently evolve to give the effect that I am after, hence the temporary basing. So here we are, with our mix of goodies, plus suitable additional terrain items scavenged from the ‘wargame chest’, ready to put on the first game. Bloggers following here will no doubt be familiar with some of the objectives. For rules, initially at least, we will use the fast play the ‘Firepower’ set that comes with the Perry box. The phasing player chooses an action for each unit, which are essentially move or charge or fire or rally. The system uses ‘hits’ and units in cover get the chance to make saving rolls against hits. As units take hits, they make morale checks, which relate to the casualty level, those that fail break and rout and are condemned to only being able to take a ‘rally’ actions as they flee. Infantry units have 150mm frontages, artillery 100mm frontages and cavalry 120mm frontages. All movement rates are randomised by various combinations of dice. There are six scenarios provided with the Firepower rules, but for fun and a bit more blog involvement the following scenario was put together ..... so here is Scenario 7! Battle at the Blogger Farms - 1863. This is a meeting engagement that will run until either side loses the will to fight on. General-Brigadier Stew, the Union Commander, has orders to secure Caveadsum Pike, but he is unaware that General-Brigadier Wall’s Brigade has already brought the road under Confederate control at Crump’s Farm. All 12 of the units, plus commanders provided in the Perry 28mm ACW Battle in a Box will be used. Battle opens with the artillery trading shots, with Bordurant's battery giving Gibson’s Battery (Confederate) the worst of it. The Confederate left flank moves to take Freitag Farm and Stonewall Field, but sharp firing from the Union stop them in their tracks and both sides settle into long range musket fire that is mostly ineffective due to the wall boundaries. To break the deadlock, 12th Ohio Pushes through a small copse and out into the gap between Stonewall Field and Crump Farm, surprising the Union centre. On their far left Rosser’s 5th Virginia Cavalry position themselves to envelop the Union flank, though that terrain is difficult to negotiate. The boldness of 12th Ohio’s advance brings them into the hornets nest that is the Union centre, but they reform quickly and with superb fire discipline, put a devastating volley into 5th North Carolina. 30th Ohio are ordered up to support the attack and they cross the ploughed field at Crump Farm, taking up position at the roadside fence. They give well aimed fire, bracing their muskets on the fence, adding further discomfort to 5th North Carolina, who turn and flee. Over on the Union left, 13th North Carolina move off Prufrock Hill and advance towards Caveadsum Pike, with Voss’ 12th Illinois Cavalry racing on ahead to take up positions at the roadside fencing, but intense Confederate fire forces the infantry to stall and then close to being wrecked as casualties rapidly mount, they fall back, leaving the cavalry isolated and who are themselves now forced to abandon the fence line. Fortunately General-Brigadier Stew happens to be on the reverse side of Prufrock Hill and he manages to rally the retreating troops, but they are too spent to make another attack and content themselves with holding the rear of the hill. The Confederate push through the middle ground has quickly brought about a collapse in the Union centre and despite 23rd North Carolina taking Freitag Farm, without reserves, they are soon being enveloped as Rosser’s cavalry close down the flank positions. With the rest of the Union brigade losing cohesion and taking heavy casualties, they are forced to pull back. Rosser’s cavalry breaks through the apple orchard in an effort to cut down the retreating troops, but becomes ensnared (random movement allowances) amongst thick undergrowth and only made it to the back line of fencing of the fields, before having to call off the pursuit. By turn 7, the Union have no choice but to leave the field of battle. They have not crossed Caveadsum Pike and so only take 1 VP for being the last to occupy Prufrock Hill. The Confederates, with surprisingly light casualties, are the last to occupy Freitag Farm, Crump Farm and Stonewall Field, getting 3 VP’s, so a clear Confederate Victory. If this had been part of a campaign game, the Confederates would be pleased with the results of this sharp action, while the Union might be grateful, having been outfought, that they had managed to preserve enough of the brigade to ensure its continued cohesion, though the loss of their guns would not doubt be felt in the coming days. 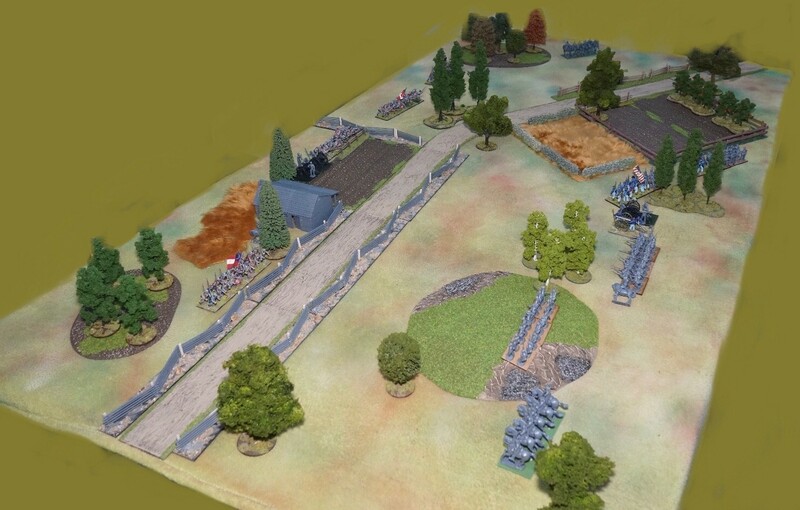 In this system, since units either move or fire in turn, not both, so the player who takes on the responsibility of advancing and taking ground can suffer higher casualties at the hands of the player that gets more firing opportunities and with the forces being the same size and composition, this could cause some problems, yet here, the Confederate advance in the centre was a great success, while the Union advance on their left wing was a disaster. It was an enjoyable table and game, so I will use the scenario again to check rule changes against it and also to run a Black Powder game and perhaps when the armies grow in size, have a dabble with my Pickett’s Charge rules, which have been sitting there for a year waiting for an excuse to try out the mechanics. Here will get updated as appropriate when various completion milestones are reached - just like I said it would in 2015 and 2016 :-). There will hopefully be more frequent coverage over on my Commanders web page (see resources below) as smaller project ‘victories’ occur. Nice report Norm, Thank you. Thanks, I rather enjoyed doing it, put a bit of fun back into blogging. Intense and nice report Norm! Thanks Phil, for a game that started without much pretension, it all went rather well. Very fun, Norm! Using your own rules would have been fitting too. Thanks Steve, yes about time they got to see the whites of the enemy eyes. Having had a go and getting a bit more intimate with the set, I do think using them will make me more inclined to paint them up. Nice project Norm, a wee bit each day and you'll soon get them finished. Great scenario backed up by some excellent graphics.As for painting the figures, I paint in 12's. There are normally 24 per ACW regiment. I found that fixing the initial 12 to the actual bases that would be finally used was a good way to tart. The remaining 12 were put on mdf and painted separately.To be honest I would cheat a biy by putting the odd terrain piece is place of a figure or two, usually a broken fence etc.I thought it gave a bit of interest to the bases and seemed to get the units finished more quickly. Thanks Robbie, 12's sounds a sensible number, I paint in 18's as that is the size of the regiment, but when it comes to the next colour or item, say gun barrels, I look at the 18 and think I've had enough today! So maybe going to a lower number per session might make me feel more progress is being made. You are fully in your stride at the moment with your Napoleonic project going at full pelt -lovely stuff. Impressive and excellent work, Norm. I saw a YouTube video on the box set.I really comes with a lot of great stuff, and at a great price. Thanks Dean, Perry have a big enough plastic ACW range to make this work (7 sets I think) and I am wondering whether they will do something similar for the medieval period at some point since they have several sets plus a building. A nice compact game. I like the map showing the moves. Thanks Peter, the game didn't take much longer to play than your recent campaign battles and in that regard, with a table already set-up, a mid week game is possible again. I enjoyed the map, though doing it via a series of iPad Apps takes longer than doing it on a Mac or PC with a single piece of software, especially as in the apps I use, there isn't a paste feature, so each unit has to be drawn individually etc. Sometimes you have to offend a few people to get somethung working for you. Good to see this moving ahead. Ross, I'm pretty sure that in our amazing wargaming journey, despite reaching a point in which you can have pretty much anything in any scale, a sophistication has developed along the way that is also present in the rest of our lives in which everything needs to be picture perfects and without flaws - and in that, we seem to has lost some of the simplicities that bring their own delights. I’m unfamiliar with these Firepower rules but from what I gathered they seem a little on the simple side. I think you’ll enjoy ACW more and more as the armies grow (never big enough). Thanks Stew, I knew it wold be a post up your street. I have blue and grey primer paints and I think that helps. The firepower rules are a step up in terms of complexity that the Thomas One Hour Wargame rules, a set which I think were too stripped back in their endeavour for simplicity. For my own taste, I can see me bolting some extra stuff onto the Firepower rules, but they are robust enough to take that. What fun! I know we mostly have a dim view of unpainted figures in tables,I think mainly it's from playing against armies that there is no intention of painting,I can't see a problem if you're happy to use unpainted figures in gaming with them as you paint them,it was my intention to use some semi painted dragoons on Sunday but they weren't far enough along for me to accept them. This is more about my figure hangups! I thought it was a good looking game, nice maps and a splendidly named turnpike! Hi Iain, Judging from internet content, it seems we all sit on different parts of the ‘what is acceptable’ spectrum, both for ouselves and others when it comes to painted / unpainted figures. For many, playing behind closed doors or just with like-minded friends I suppose it matters little, everyone just gets on with it, but going public (i.e. a blog) exposes one to scrutiny and opinion, so it can start to matter more. For me, the acceptable part is to have the ambition to try and do things nicely within time and budget restraints (the two factors that affect us all), but I am pleased that I have been able to use the public platform of a blog to say ‘I think it’s OK to game like this’ simply because we seem generally to have got ourselves to a point that gamers daren’t put their unpainted stuff above the internet parapet, lest a head gets blown off. Having said all of that, creased gaming cloths at public displays, say a wargame show or on a blog that is setting an example of a ‘good game’ leaves me desparing, that is an easy fix that should never get to the table, but even then I hold back and think, here is someone enjoying gaming and trying to share that pleasure and then I feel guilty about being judgmental about hobby time / pleasures / budgets etc. Now that it is on the internet, Caveadsum Pike will of course become a real :-) Thank you for always supporting the posts here. Well probably the only time I'll see myself go down in history , even if it is a past one! Again a great account - talk about great oak trees from small acorns.